In January 1959 Methane Pioneer, a converted World War II freighter containing five aluminum prismatic tanks, carried a liquefied natural gas cargo from Lake Charles, La., to Canvey Island, United Kingdom. This demonstrated that the transportation of large quantities of LNG safely across the ocean was possible. By the turn of the century industry employed more than $200 billion in capital. The LNG industry started in 1964 with the first shipments from Algeria to the UK. By the late 1990s the intervening years international trade in LNG increased 50 fold, production capacity has increased 10 fold and the transport capacity of individual ships has increased 5 fold. The first gas carrier tanks that were used in a continuous regular trade in the United States were of the membrane tank design. In 1965 Phillips Petroleum contacted the Coast Guard concerning a proposal that the energy company had made to Tokyo Gas for shipping LNG from Alaska. The shipments were to be made in tanks that were designed by Worms and Co., Paris, France. This design later became known as the Gaz Transport design. At first, the LNG carriers were envisioned as being 34,000 cubic meters, but eventually the design called for the 71,500 cubic meter vessels that became the Artic Tokyo and Polar Alaska. Höegh built the world's first LNG carrier with spherical tanks in 1973. Norman Lady was delivered in November 1973, from the Rosenberg shipyard in Norway. The vessel was the prototype of the Moss spherical cargo containment system. Leif Höegh & Co took an active role in the development of this system. The first Australian LNG was shipped from Karratha in 1989. In 1997 Australia exported 7.5mt worth around $1.7 billion almost exclusively to Japan. This amounts to around 10% of world trade, and that fact, combined with the estimate 100tcf of known gas reserves in Australia, are factors that put Australia in a promising position for more LNG development. Commencing with its first delivery of an LNG carrier in the early 1990s, Hyundai consecutively expanded its construction capacity for vessels up to 138,000cubic meters, making their shipyard the first in the world available for building both Moss-type and membrane-type LNG carriers, taking ever-increasing orders for high capacity vessels. These include the new membrane-type carrier measuring 280m in length, 43m in width and 26m in depth, made up of four independent tanks insulated with polyurethane panels, which is the largest LNG carrier of this type ever made. Since the first delivery of LNG carriers back in the early 1990s, responding to the increasing demand requiring clean energy sources, Hyundai has played a leading role in building LNG carriers and has built a cumulative total of 7 large LNG carriers. In 1999 Samsung Heavy Ind. successfully constructed the world's largest New Membrane-type LNG carrier, which was the largest single hull-form vessel in the world at that time. Lighter and faster than the existing LNG vessels, it had a price equivalent to 10 freighters ($220 million). This vessel measures 278.8m in length, 42.6m in width and 26.0 m in depth, and navigates at 20.7 knots. It is the largest single hull-form vessel in the world and can carry 138,378 cbm of natural gas. It weighs 13% less than the standard membrane-type LNG vessel. Samsung Heavy Industries reduced the cargo-hold insulation plate with a high-tech method to 250mm, half the thickness of the existing record of 530mm. SHI used Korea-made stainless materials that are more durable than nickel alloy steel and halved the welding area in order to reduce operation (fuel) as well as construction costs. Samsung's 183,000 m3 Supreme was the largest LNG carrier of GTT Mark-Ill membrane type. In this containment system, developed by Gaz Transport & Technigaz of France, the cargo tanks are protected by a complete double side/bottom, cofferdam between each tank and trunk at topside. Cargo is carried at -163[degrees]C at near atmospheric pressure, with the tanks featuring a 250 mm insulation and a membrane of I .2 mm thick corrugated stainless steel sheet. Each cargo tank is fitted with two 1,700[m.sub.3]/h submerged centrifugal pumps which are capable of unloading cargo within 12 hours. Propulsion machinery comprises a 39,500 shp Kawasaki steam turbine set driving a fixed propeller through a double reduction gear box. Service speed is 20.8 knots with a 21% sea margin. Steam is generated by two Kawasaki boilers, capable of burning fuel oil, boil-off gas or a combination of both. Electrical power is supplied by two turbo-alternators, each producing 3,450 kW, and a stand-by 3,450 kW dieseldriven set. In 2000 the El Paso Corporation began to explore the novel concept of shipboard LNG regasification. The theory was that an offshore offloading system could be designed and built at far less cost than a shorebased facility and that, by delivering the product offshore in its gaseous state, expensive shore-based facilities could be eliminated from the transport equation. El Paso chose the Gulf of Mexico for its initial installation, selecting a site 116 miles off the Louisiana-Texas border as the location of a deepwater port named the Gulf Gateway Energy Bridge. 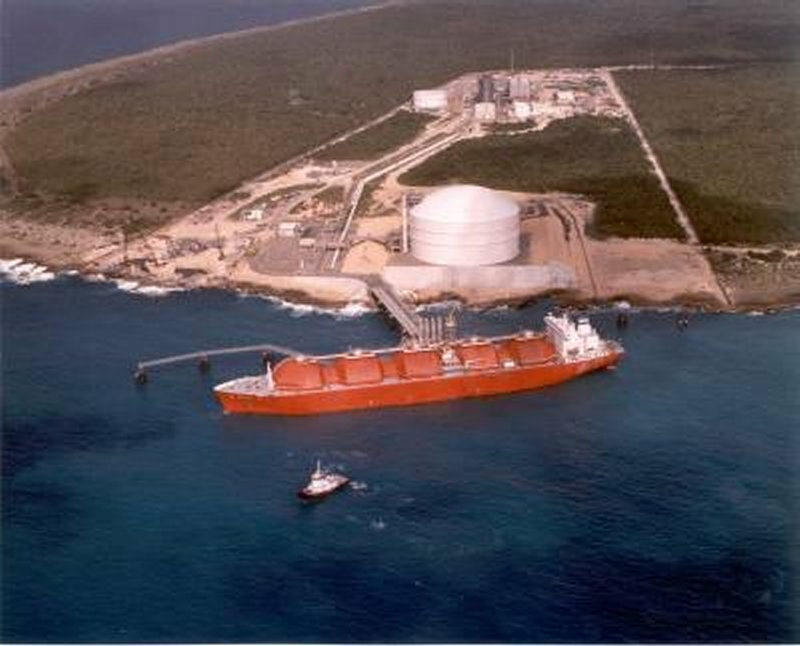 In 2003 El Paso's work was purchased by Excelerate Energy, who then proceeded to build the port. In fall 2000 Williams Cove Point LNG Limited Partnership announced plans to reactivate its Cove Point liquefied natural gas (LNG) offshore marine terminal located in the Chesapeake Bay off Lusby, MD. Resuming the terminal to operational status would represent the return of LNG shipping to the Upper Chesapeake for the first time in over 20 years. The Cove Point facility was built in the 1970s through a partnership between the former Consolidated Natural Gas Company, the parent of what is now Dominion Transmission, and the Columbia Gas System to receive, store, and process supplies of LNG shipped from such producing countries as Algeria and Trinidad. Cove Point received approximately 90 ship-borne LNG imports between 1978 and 1980. Recognizing the growing need for natural gas, the high-level interest from the energy industry to import more LNG, and the concerns surrounding the siting of shore-side facilities and the desire to site them in more remote locations, Congress added natural gas to the Deepwater Port Act as part of the Maritime Transportation Security Act (MTSA) of 2002. Since that time, 11 applications for LNG deepwater ports had been submitted to the Coast Guard. What changed is that the price of natural gas began moving upward (expected above $10 per million BTUs by the winter of 2005) and at the same time improving technology and increasing efficiency reduced the liquefaction and transportation costs. 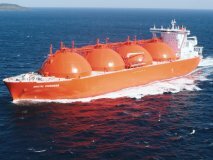 On October 2, 2003, the Energy Frontier, an LNG carrier owned by Tokyo Gas' wholly owned subsidiary Tokyo LNG Tanker Co., Ltd., delivered approximately 67,000 tons of LNG to Tokyo Gas' Sodegaura LNG Terminal from Malaysia. The Energy Frontier is a moss-type carrier, having four spherical-shaped tanks. This carrier was designed on the scale of a conventional LNG carrier, but with 10,000m3 greater LNG load capacity, which at 145,000m3 made it the world's largest LNG carrier. The 145,000m3 of LNG, equivalent to the weight capacity of approximately 67,000 tons, produce approximately 87 million m3 of natural gas when re-gasified. This is equivalent to the amount of gas used by 200,000 households each year. Initially steam turbines dominated as propulsion machinery for LNG carriers, with their apparent reliability and the ease with which they can burn the boil-off gas from the ship's cargo tanks while at sea. The low fuel efficiency of steam turbines, however, encouraged almost all other shipping segments to switch to diesel-powered ships. As a result of both increased fuel efficiency and increased cargo capacity, an LNG carrier with dual-fuel electric machinery will deliver more natural gas to the offloading terminal even when gas is used as fuel throughout the voyage. This engine type promises big benefits for LNG operators including larger cargo capacity, lower fuel consumption, higher flexibility in operation, and lower emissions. The order in autumn 2003 for a 153,000 m3 LNG carrier by Gaz de France at Chantiers de l'Atlantique proved the point. The ship, due for delivery in 2005, is propelled by dual-fuel engines and electric propulsion. The heart of the system is four dual-fuel engines - three 12-cylinder and one 6-cylinder Wärtsilä 50DF - giving a combined output of 39.9 MW. The ship was the largest LNG carrier in service when it was delivered. As of 2006 there were approximately 180 LNG carriers in operation, with a total capacity of over 21 million m3. All of these LNG carriers were built in Japan, Korea, Europe, or the United States. Of these, 16 ships had a capacity of less than 50,000 m3; 15 ships have a capacity between 50,001 to 100,000 m3; and 150 ships have a capacity between 100,001 m3 and 150,000 m3. Most of the smaller LNG carriers have been in service for several decades, and it is likely that they will be replaced by much larger ships. Mitsubishi Heavy Industries in Nagasaki, Japan; as well as Daewoo Shipbuilding and Marine Engineering and Samsung Shipbuilding, both in Korea, have focused on the construction of membrane tank liquefied natural gas vessels. Meanwhile, Hyundai Heavy Industries has developed a spherical tank design, along with its mobile offshore drilling unit construction program. Other builders in Asia with a proven LNG carrier construction program include Kawasaki Heavy Industries and Mitsui Shipbuilding. Larger vessels with new propulsion and cargo containment systems are now under construction and will be followed by even larger ships in the near future. Plans in Qatar, with its reserve of 14 trillion cubic meters of natural gas, include construction of as many as 46 additional LNG carriers. Owner representation is generally less expensive to maintain in South Korea. This has led to larger owner representative site teams in South Korea than that of their counterparts in Japan. Shipbuilders in Korea have built an infrastructure (including schools and medical facilities) solely for the support of the owner representatives at all major shipbuilding facilities in the area. In Ulsan, South Korea, a complete lodging facility identified as "The Foreigner Compound" is available to customers of Hyundai Heavy Industries,and provides a community atmosphere, including a clubhouse for the members of the on-site teams. In 2004, of 125 vessels constructed by the 10 most prominent builders, 85 (68 percent) were constructed in Asian shipyards. This majority representation is set to increase, as orders for additional LNG carriers during the next few years have filled all available construction slots. In the first five months of 2005 alone, there were five new LNG carriers added to the fleet with a combined carrying capacity of 699,000 m3. The addition of these five LNG carriers represented a 3 percent net increase in the liquefied natural gas shipping capacity worldwide and is indicative of the expanding LNG market. The anticipated growth of the LNG market is well represented by the number of LNG carriers that are scheduled for construction. Throughout the world, as of 2006 shipbuilders had plans to build 115 new LNG carriers, with a combined total carrying capacity of more than 17,000,000 m3. There are only nine shipyards in the world building LNG tankers: Three are in Japan, three are in Korea, two are in Europe, and one is in China. Among carriers now scheduled, two ships will have capacity of less than 50,000 m3, three ships will have capacity between 50,000 to 100,000 m3, 76 ships will have capacity between 100,001 to 150,000 m3, 24 ships will have capacity between 150,001 to 200,000 m3, and 10 ships will have capacity over 200,000 m3. This reveals that the trend in LNG shipbuilding is toward larger ships to accommodate the increasing LNG demand. The size of LNG carriers is expected to grow, but will be limited by the size of the ports at the marine terminals they service. The ARCTIC PRINCESS, delivered in January 2006, was the largest LNG carrier ever built, though this record was soon challenged. ARCTIC PRINCESS is 288 meters long and has a fully-laden capacity of 147 000 cubic meters of LNG. The LNG is carried at a temperature of minus 163 degrees centigrade in four spherical tanks, each with a diameter of 42 meters. A full cargo load of LNG is sufficient to cover the yearly energy consumption of all households in a city with a population of 45,000 people.